Two, three and four door units with stainless steel or granite tops. Optional doors/drawers, refrigerated topping units, inset gastronorm containers, mounted on casters. 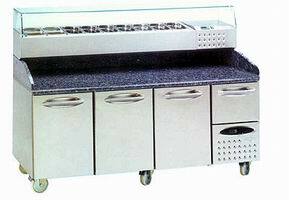 Gastronorm refrigerated counter worktables also available.